Euclid Tsakalotos, the finance minister, is confident that Greece will beat these targets, freeing up budgetary space for tax cuts and greater investment and social spending. But Greece’s public-debt burden of 180% of GDP means that creditors’ faith in the public finances is vulnerable to missed targets, slow growth or a sharp rise in interest rates. In a report released on July 31st the IMF said that further debt relief might be needed. After years of contraction, followed by stagnation, the economy is growing again. But Mr Vourvoulakis and most of his compatriots are yet to feel the benefit. The crisis caused profound damage to the economy. In real terms, GDP and investment are significantly below pre-crisis peaks (see chart). A fifth of the workforce, and two-fifths of young people, are unemployed. For Greeks lucky enough to have jobs, wages have been slashed and taxes raised. Hundreds of thousands of mostly young and skilled people have left the country in search of better livelihoods. The crisis exposed deep flaws in Greece’s economic model. It relied too much on low interest rates, which funded splurges on public spending and housing, and too little on exports. Wages had far outstripped productivity, making the country less competitive than many others in the euro zone. The government bureaucracy and courts were corrupt and inefficient. Greece was a forbidding place for foreign investors and new businesses. The situation is now improving, though slowly. Exports have risen, partly thanks to a doubling in the number of tourists visiting Greece (though Spain and Ireland, which also struggled after the financial crisis, have seen exports grow more). Competitiveness has improved because of falling nominal wages—a painful way to adjust, but the only one possible in a currency union with low inflation. The government’s belt-tightening has been drastic—and counterproductive, many economists argue. Tax rates are now higher than in most of the European Union, points out Miranda Xafa of the Centre for International Governance Innovation, and may be choking growth. The tax-free threshold is higher than the median private-sector wage, meaning revenues depend on a small share of taxpayers. The marginal rate for Greeks earning €40,000 ($46,500) or above (including social-security contributions) is around 70%. Ms Xafa thinks that evasion may be rising, as self-employed people conceal their income. At its creditors’ insistence, the government will broaden the tax base in 2020. Growth is still disappointing. GDP rose by 1.4% in 2017, and is expected to increase by around 2% this year. The IMF is gloomy about the economy’s potential, partly because of a rapidly ageing population. The banking system is still ailing. Just under half of existing loans are non-performing, and banks have little appetite to offer new credit. They are now better set up to sell non-performing assets, but working out how much collateral is worth and which indebted businesses can survive will take time. Even if banks’ targets are hit by the end of 2019, bad loans will still account for over a third of the books. The biggest barrier to growth, though, is that it is still harder to do business in Greece than in other European countries. Take the €8bn privatisation of Hellenikon, the site of the old Athens airport. The lease for the land was put out to tender in 2011 and eventually bought by a consortium of Greek, Chinese and Emirati investors, who intend to turn it into a holiday resort. But delays, arguments over terms and investigations by environmental agencies mean that the buyer has yet to break ground. Improvements to the business environment, justice system and public administration are all on Mr Tsakalotos’s agenda. But critics doubt his government’s commitment to reform. 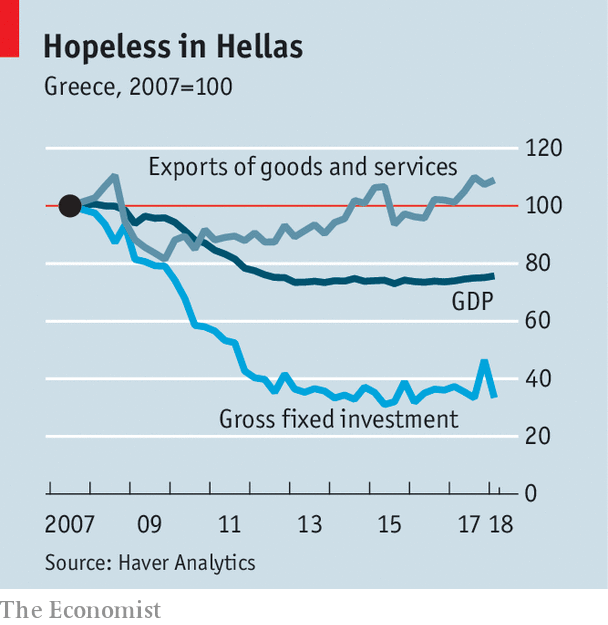 Greece rose rapidly up the World Bank’s Doing Business rankings until 2015, when a coalition government led by Syriza, a radical left-wing party, came to power. It has rowed back on some of its predecessors’ reforms, such as liberalising highly regulated professions and curbing collective wage-bargaining. The IMF frets that pay rises might once again become untethered from productivity gains. With a general election due by October 2019, the government could roll back even more reforms in order to win the support of interest groups. Economists suspect that both financial markets and creditors pay more attention to the fiscal targets being pursued by Mr Tsakolotos. That leaves important and politically difficult reforms by the wayside.